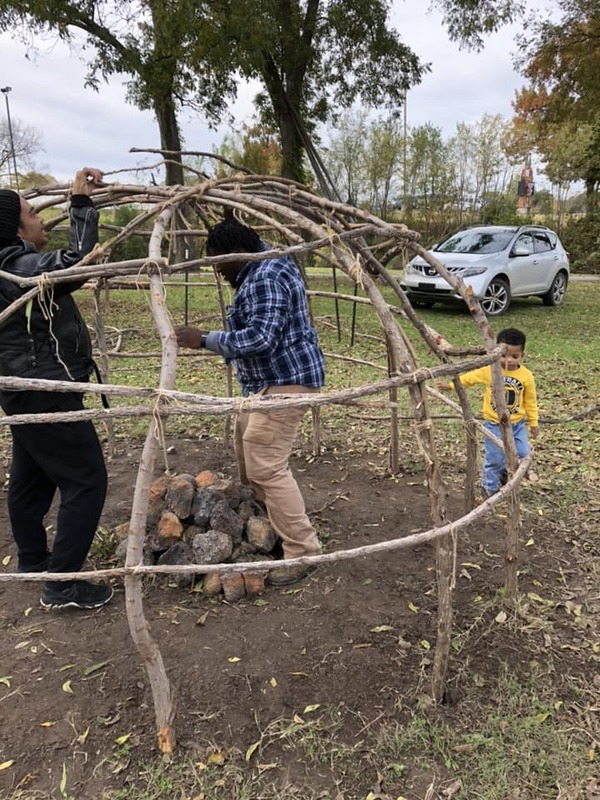 The tenets of physical wellness, Native American culture and spirituality come together as SONS participants build a sweat lodge. For men representing the values of respect and responsibility in rural Okmulgee, Oklahoma, the secret to success often comes down to just being there. It means coming together in support – and not in competition – as a steady, stable mentor and friend to the area’s young men and boys. Today, with support from First Nations Development Institute (First Nations), the SONS of Mvskoke are consistently present, as role models and facilitators, committed to serving the Muscogee (Creek) Nation. The SONS of Mvskoke began when several of its members first worked with the Muscogee Tribe in a family violence prevention initiative called Warriors Honor Women. Their focus was on involving men in solutions to protecting families. While that program eventually ran its course, questions remained about the causes of domestic violence. Executive Director Monte Randall says SONS serves to give back to the Muscogee Tribe. 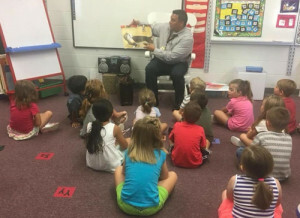 Here, a SONS volunteer reads to students at Glenpool Elementary School. “We continued to see a need to get men together to talk about what we all face,” said SONS of Mvskoke Chief Executive Officer Monte Randall. Indeed, there were few channels in Okmulgee for men to collaborate and support each other in ways that were non-competitive and not blame-based. The SONS decided to continue meeting and to formalize their own structure to support men and give back to the tribe. Their focus would be mentoring and community-based programs and events that bring men together in ways that show responsibility and respect. 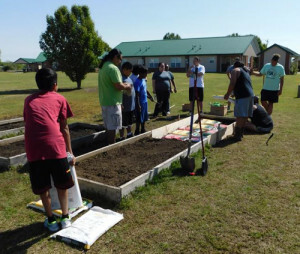 As a newly formed 501(c)(3) organization, the SONS began hosting monthly events and activities open to the community based on the SONS’ four tenets: spiritual, physical wellness, Native American culture, and leadership. These events and activities are designed to encompass at least one of those tenets. For example, fishing trips or sporting events incorporate physical wellness, whereas planting an elders’ garden, bow shooting, language lessons and sweat lodges involve several of the tenets. Funding from First Nations and RISE will help SONS continue many programs, including the elders’ garden. At the same time, bringing men together – even in a cultural setting – does present challenges. One of the biggest, Randall said, has been participation. Randall explained that their first focus as a formal organization was providing a mentoring program. Yet, as they started identifying youth, they quickly saw a problem finding older men. 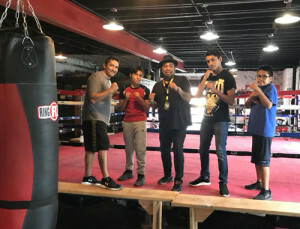 A field trip to the Tulsa Boxing Gym brings young men and boys together in respect and responsibility. Randall said he believes demands on men in the form of work, families and other commitments make it difficult for many to participate. Yet, he said, if we don’t take time to come together, to reinforce that culture, we’ll never be able to show that respect and responsibility, he said. “We have to see what it is and address it,” Randall said. To that end, SONS is moving forward with positive, action-based, non-blaming programming, making events open and available for all who can come. He said sometimes many men come, and sometimes only a few people can show up, but either way, SONS continues to instill that presence. 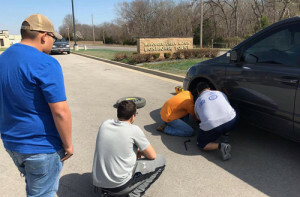 The SONS of Mvskoke mentoring program teaches young men hands-on skills such as car maintenance. Funds from First Nation have supported this work, and the grant to SONS was made possible through RISE for Boys and Men of Color (BMOC). RISE BMOC is a project co-led by Equal Measure, a national nonprofit evaluation and philanthropic services firm, and the University of Southern California (USC), Rossier School of Education, USC Race and Equity Center. RISE for Boys and Men of Color is a field advancement effort that aims to better understand and strategically improve the lives, experiences and outcomes of boys and men of color in the United States. RISE spans five fields (education, health, human services and social policy, juvenile and criminal justice, and workforce development) and focuses on four populations (Asian Americans and Pacific Islanders, Blacks, Latinos and Native Americans). The funding to SONS is being used to expand programming, including SONS’ recent Men’s Summit, annual Toy Drive luncheon, and Cultural Garden. Importantly, funding is helping the SONS of Mvskoke continue serving the Creek Tribe. And for the men and boys of Okmulgee, the activities, events and role models for respect and responsibility are adding up to big impact. This entry was posted in NL03 by rblauvelt. Bookmark the permalink.